Today I decided to finally cross off something of my ‘to do list’ I’ve been dreading for a long time now. Those who know me know that I’m a sucker for pretty packaging, especially when it comes to makeup and beauty products, which resulted in me hoarding those things like crazy for the past few years. Especially the makeup was getting out of control. I bought makeup I would never even wear, but just bought because it looked so pretty or because “some day” I was really going to do a full face makeup on a regular basis. Well, “someday” never came and my makeup stash kept growing and growing. Don’t get me wrong, I love makeup! I think it’s a wonderful thing to enhance your natural beauty a bit more. There have been times I wouldn’t leave the house without makeup on, but luckily I grew more confident about my own appearance and don’t need makeup to feel good about myself anymore. When I do apply makeup, it’s because I want it, not because I need it. So today the long and difficult process of sorting out all my makeup and beauty supplies started. I already threw out a lot of it a few weeks ago, but there was still plenty left. While sorting out all my makeup, I noticed I had a really hard time letting go of some of the items, especially the completely unused items and the expensive ones. It just felt like a waste to throw them out, which, of course, it was. But just because it’s a waste, doesn’t mean you should hold on to it. For me, it just didn’t feel right. All that stuff was weighing me down, because every time I saw it, I felt the pressure to use it. Something I didn’t want, because I don’t feel comfortable wearing foundation or lipstick, and believe me, I had a lot of those! While I’m usually pretty down to earth when it comes to cleaning out my belongings, the little voice inside my head saying “but…” and “what if…” became pretty present during the few hours it took me to sort out all the makeup and beauty supplies. I guess the reason I had a harder time sorting those things out than sorting out clothing and other belongings, is because I always felt, until the past few years, that I needed makeup to feel okay about myself and to get accepted by others. My addiction to beauty supplies and makeup started at a young age, making it harder to let go of, because it had been such a big fundamental part of me for many years. So what got me to finally throw out all that stuff? First of all, necessity. Necessity really is the mother of invention. It usually isn’t until we really need to, before we change. As you all could read in my previous blog, I’m moving next month and the new house is quite a bit smaller than my current one, calling for some serious minimalising. Second of all, the burden of all those products was becoming more and more present. Every time I opened up the drawer, there were those products again, becoming heavier on me everything I saw them. Third of all, those products represent the old me, the past, the times I felt incomplete and unaccepted without makeup. It became quite a process, but once I really got into the right mindset, it became a lot easier! Yes, it still was a struggle and it really made me realise how dependent a person can be on stuff, but it was worth it (oh, that reminds me of that brand new L’Oréal shampoo I really didn’t like I just got rid of). 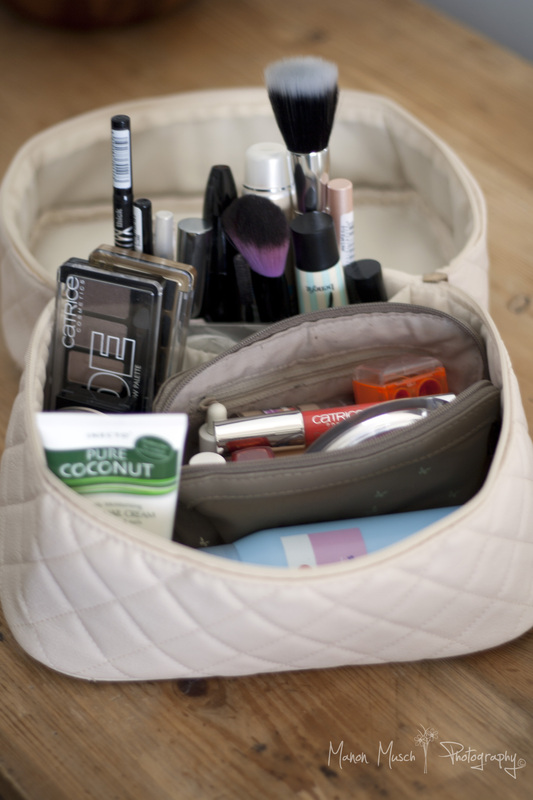 Something that really helped me was to Google ‘Minimalist Makeup Bag’ and to just look at the makeup supplies others have and to read there stories. So thank you all who are sharing there experiences with minimalism. Another thing that helped me, was to pick items that felt good to me. For instance, I had a lot of lip balms, and when I say a lot, I mean A LOT! I only kept the ones based on natural products, and got rid of all the other ones. Maybe you also could use a little bit of help sorting out your bathroom cabinets, so here are some tips that really helped me along. What are your favourite beauty items? Mascara, eyeliner, eyeshadow? And which brands? Those are probably the items you use on a regular basis. Keep those items. Those are clearly the items you really like and use, so no need to throw them out. If you have extras of those items (like I do. I have a habit of buying extras of items I really love, in case they get discharged), store them until you run out of the one you’re currently using). Which beauty items you own do you never use? Even when you answered ‘mascara and eyeliner’ on the first question, you can still have mascaras and eyeliners lying around that you never use. Maybe you’ve bought them because the ad looked great or because of the nice packaging. Maybe you’ve tried them out ones and decided you didn’t like the product or maybe you never even broke the seal on the packaging. Throw those items out or give them away. These are the items that are cluttering your life and mind, weighing you down. Which beauty items you own don’t you like? Do you own lipsticks even though you really don’t like wearing them? Or maybe it’s foundation, blush, powder, whatever. If you don’t feel comfortable wearing it, it’s time to part with those items. You probably will never use them or if you do, you won’t feel good about it. Do you have a hard time throwing out unused items? Give them to someone else! Someone else might love them and that way, it might not feel as such a waste to you. Make a list! Sometimes something as simple as setting a certain amount of products you are “allowed” to keep, makes things a whole lot easier! That total amount is totally up to you, just pick a number that feels comfortable to you. Maybe that number is three, maybe 50, whatever makes you feel good. 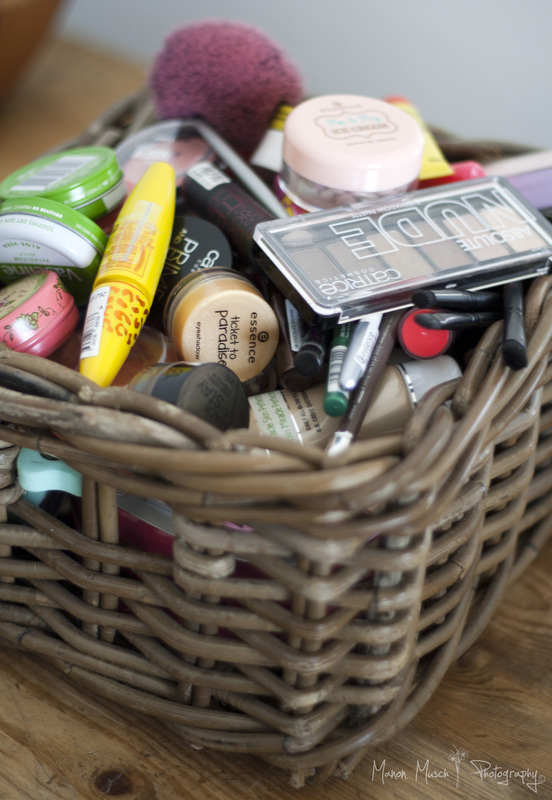 You can even create a list of products and put a number behind it (for instance: Mascara (2), eyeliner (4)). Here’s the list of items I ended up with. My total amount came down to 30. It still seems like a lot, but right now, these are the items I feel comfortable keeping. If it turns out I won’t be using some of these items, I will get rid of them. In the end, I’m really proud of how I handled this process. It might seem trifle to some, like it’s just throwing out makeup, but to me it was closing a chapter of my life. It took me two full years to realise that I don’t need all that stuff to feel good about myself, that I don’t need makeup to be pretty, so to finally getting rid of all those beauty supplies and makeup items really meant a lot to me. I feel so much lighter now and the items I kept, are items I really love. I find it much easier to throw away new or barely used make-up when I tell myself that it’s expired and probably really bad for me. Yes, that’s something I also told myself. I mean, I was still holding on to makeup that have been in my possession for years! When I had a new copy of a product I’m using lying around, I replaced the used one for the new one. That way I’ll be using the unused items, but still getting rid of stuff.